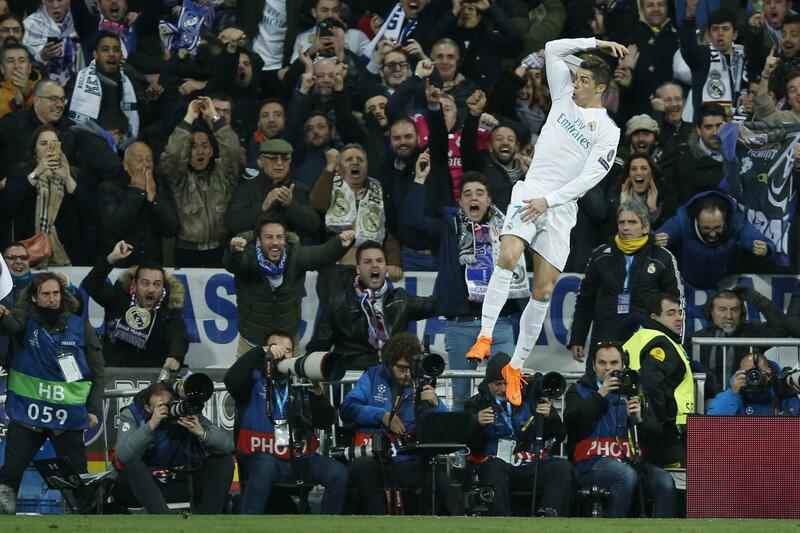 Wed., Feb. 14, 2018, 3:34 p.m.
MADRID – Paris Saint-Germain showed its strength against the European champions, but it wasn’t enough to stop Cristiano Ronaldo. Ronaldo scored a goal in each half as Real Madrid came from behind to defeat PSG 3-1 in their first-leg match in the last 16 of the Champions League on Wednesday, taking a commanding lead into the second leg in Paris on March 6. Ronaldo increased his Champions League tally with Madrid to 101 goals in 95 matches, a record for a player with the same club. He has 11 goals in seven Champions League matches this season, the most of any player. Ronaldo has scored in each of the first seven Champions League matches this season, also a record. He has netted at least 10 goals in the tournament for seven straight seasons. On a mission to become a major force in European soccer, PSG played well from the start in an exciting back-and-forth match against the two-time defending champions, but the late goals significantly hurt their chances of finally succeeding in the Champions League. This was PSG’s first significant test since the Qatari-funded club spent a record 222 million euros to sign Neymar from Barcelona in a bid to break into the continent’s elite. Triumph against PSG could help Madrid turn its fortunes around in what has been an up-and-down season for the Spanish powerhouse. Zidane’s job has been in doubt after a series of poor results in the Spanish league and the Copa del Rey. Liverpool thrashed Porto 5-0 in Portugal in Wednesday’s other Champions League match. PSG struck first with a goal by Adrien Rabiot, but Ronaldo equalized by converting a penalty kick just before halftime and added to the lead in the 83rd. Marcelo sealed the victory three minutes later. Madrid, which has won the Champions League in three of the last four seasons, had appeared in control but PSG opened the scoring in the 33rd with Rabiot’s shot from inside the area on a play that involved all three PSG forwards. Kylian Mbappe started it with a run on the right side, then Edinson Cavani smartly let the ball through after Mbappe’s cross into the area and it ended with Rabiot after Neymar’s attempt was deflected by a defender. Not long before the goal, Ronaldo squandered one of the game’s best chances in a one-on-one situation with Alphonse Areola, his shot hitting the goalkeeper’s face. Ronaldo also missed soon after, sending a close-range shot over the crossbar. But he was perfect from the penalty spot just before halftime after Toni Kroos was gently pulled inside the area by Giovani Lo Celso, the young midfielder who was a surprise addition to the starting lineup in place of Lassana Diarra. Areola dived the correct way – to his right – but wasn’t able to stop Ronaldo’s firm shot. Areola had just made a brilliant save on Karim Benzema’s well-placed strike from just outside the area. It was PSG which was in command in the second half, creating most of the significant chances, but Ronaldo struck again by scoring the go-ahead and slightly chaotic goal with his knee after Areola parried a low cross by substitute Marco Asensio. It only got better for Madrid when Marcelo scored from inside the area after another cross from Asensio from the left side. The match had to be briefly stopped in the second half after a cross by Neymar hit the face of referee Gianluca Rocchi, who continued after receiving medical assistance. Published: Feb. 14, 2018, 3:34 p.m.